But wait a minute. Why was the bike known variously as "the spin-dryer" or "Buck Rogers' shopping trolley" flirting so openly in the first place ? 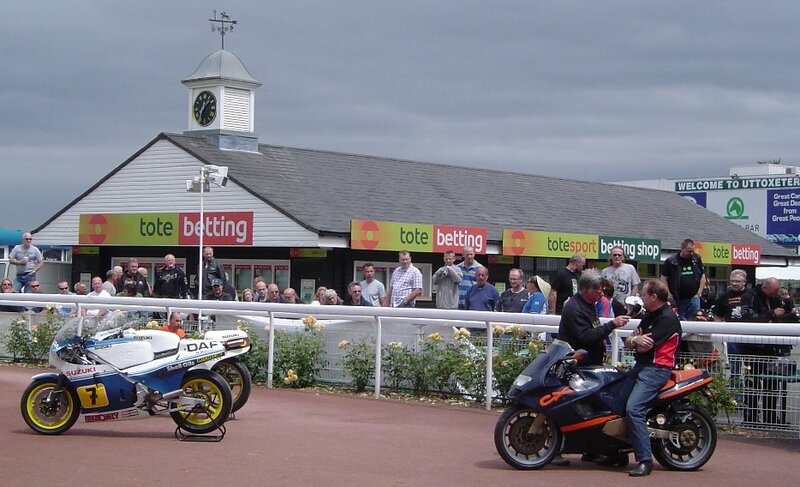 The occasion was the 4th running of the VJMC Classic Bike Show at Uttoxeter Racecourse, and the 4th appearance there by Diff'rent Strokers. 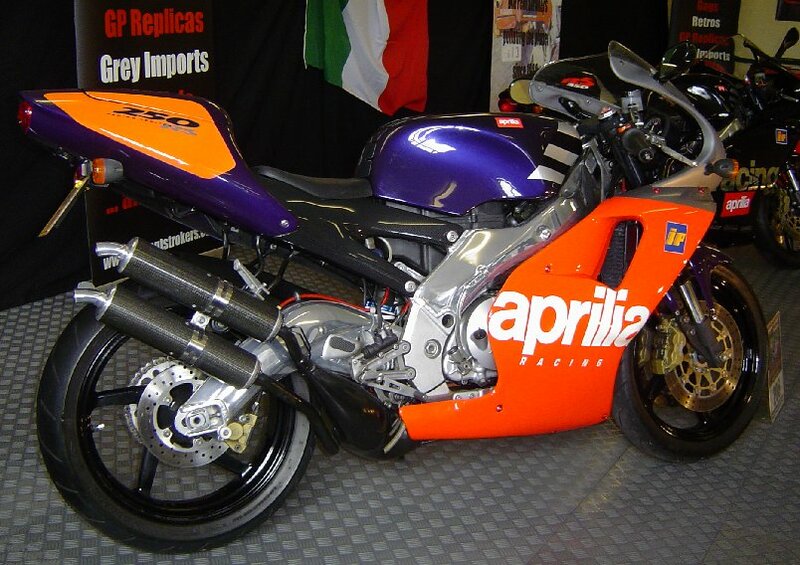 For reasons now lost in the mists of time we'd decided on an all-Italian two-stroke theme for this show. We have to provide the organisers with a list of the bikes we're taking well in advance so they can publish the showguide. We jot down a few guaranteed attendees and then make up the rest, knowing we have a couple of months to actually track down suitable owners and persuade them to join in. This normally works fine - not this time. We told 'em we'd be taking ten bikes along, ranging from 125cc sportsbikes through classic scooters up to the ultimate stroker road bike, the Bimota V-Due. 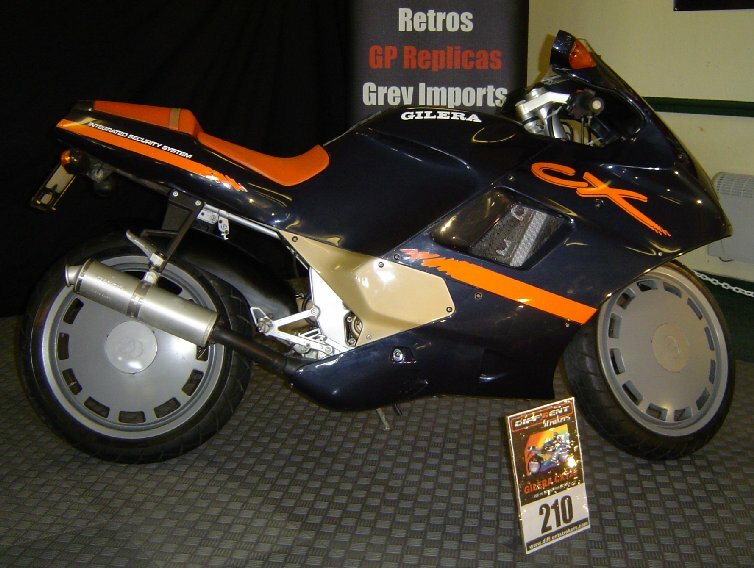 The Gilera chose itself, along with Darin's early RS250 Aprilia. 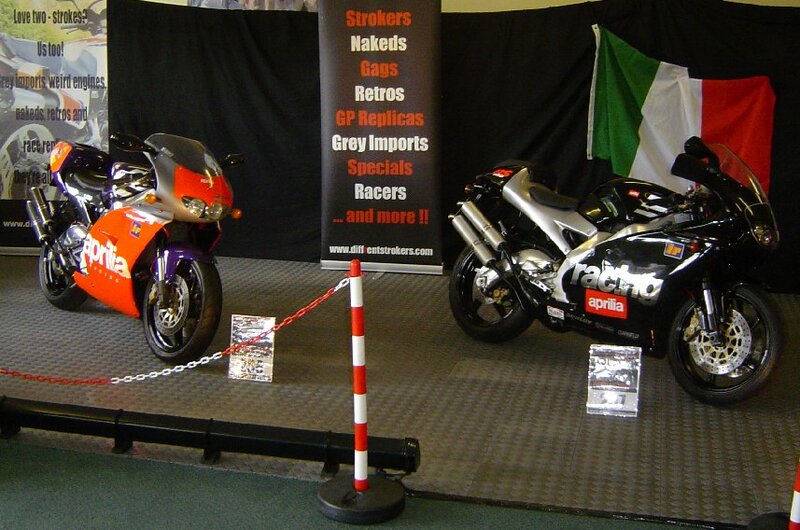 Mike's later RS250 provided a nice comparison. A DS member put us in touch with V-Due owner Steve who said he'd be up for it too. Looking good ! Then the plan started to unravel. 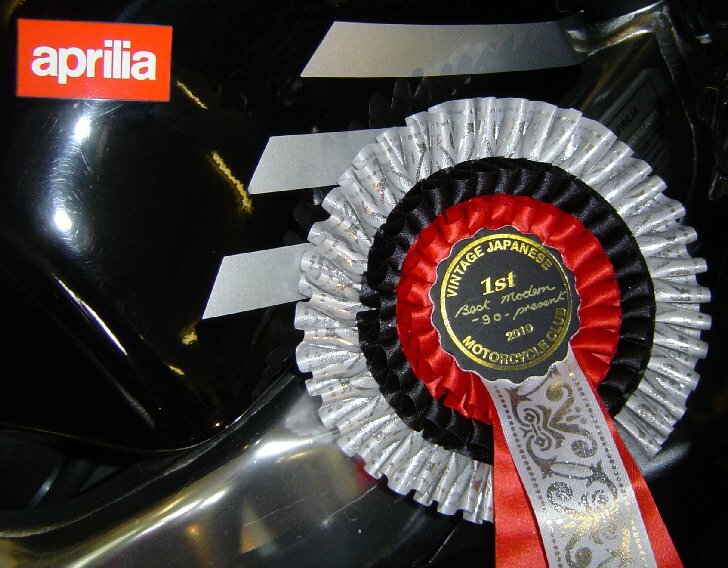 A Lambretta we thought was a definite entry now couldn't make it (our fault not his) and a trackday-prepped RS250 went the same way. Someone we knew with a shed full of quirky 125's would be away on holiday that weekend. 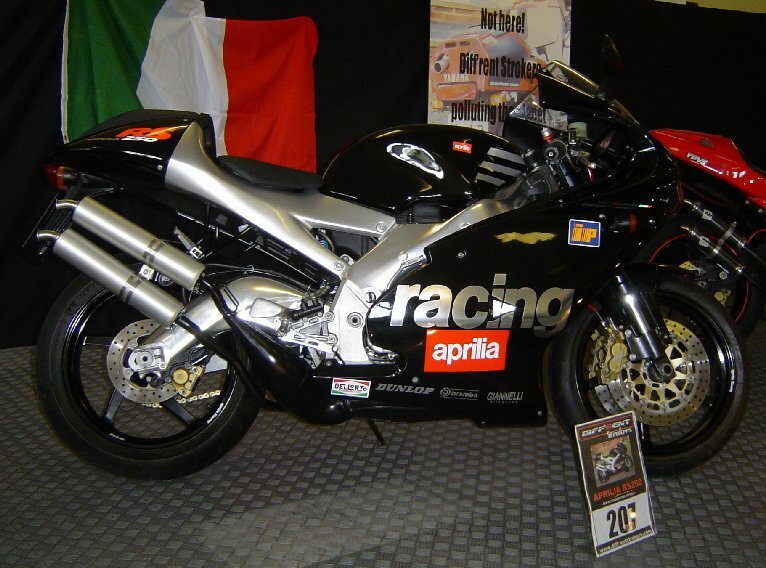 Tim looked at his garage full of 100%-Japanese machines and started searching Ebay for Cagiva Freccia's and SuperCity's. He didn't buy one. 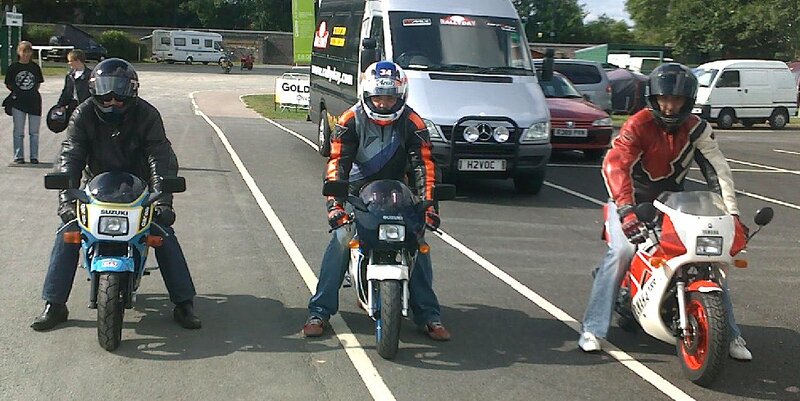 Instead he tracked down a chap on another forum who volunteered his Aprilia AF1 and Gilera GFR 125's. Doug then offered his stunning 350-engined Mito special which put us nicely back on track. Another potential Lambretta failed to materialise as did an Italjet Dragster 180. Seven bikes then. That would have to do. We had the same location as usual, in the pavilion. Tim turned up early Friday afternoon and unloaded the backdrop and lighting along with the new shop counters, then went off to find the hotel to check everyone in. Everyone else seemed to run into various traffic jams but by 7:30pm there were four bikes parked in a neat row and the pub beckoned. 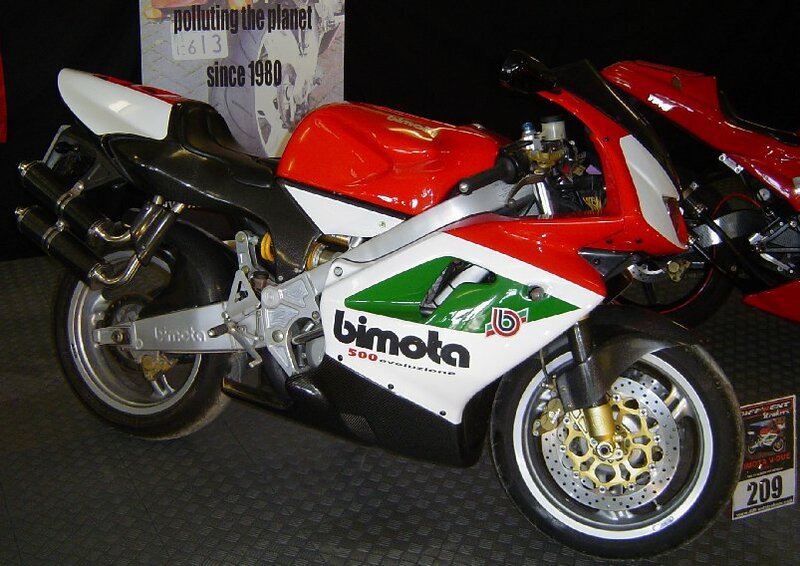 Steve couldn't get the Saturday off work so we weren't expecting the Bimota until Sunday morning. 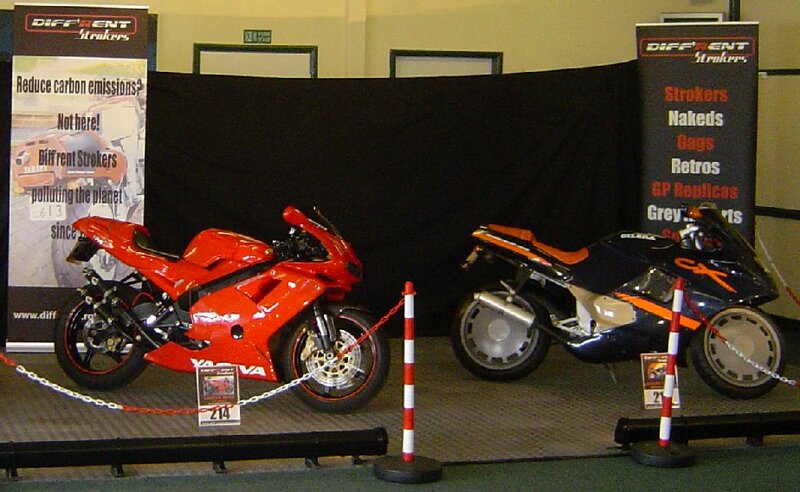 We were expecting the pair of 125's to arrive but by 9:30am when the gates opened to the public they hadn't appeared. In fact they didn't show up at all, which left us slightly embarrassed about our underpopulated stand. The four bikes we did have were spread out as much as possible and to be fair, it looked much better than it sounds. Saturday was quiet, despite the organisers claim that tickets sales were up on the previous year. Loyal DS'ers Andy B, Mick and Rob B all popped along for a chat. The shop counters were filled with T-shirts, keyrings and stickers, plus new posh collared shirts and even DS-branded jackets. We didn't exactly sell out of anything though. We also had the updated slideshow presentation running on an LCD screen alongside, which captured a bit more attention than last year. 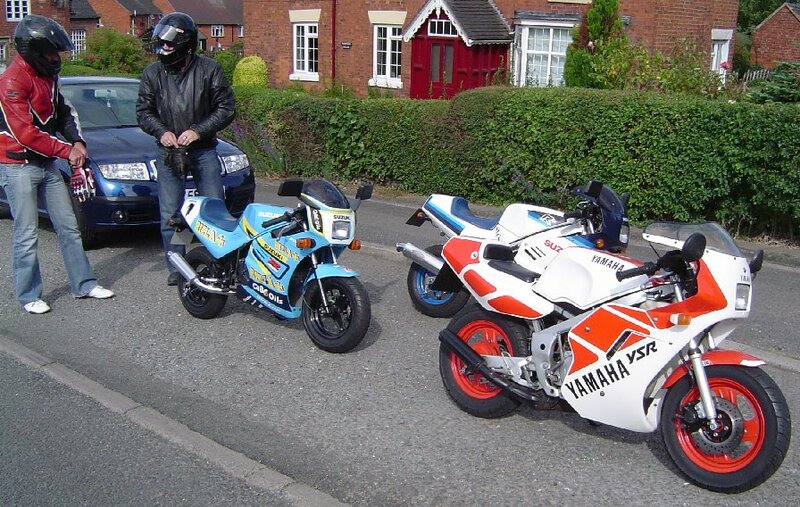 Mick had invited us to join in on the Fizzy Club's Saturday evening rideout, if we brought appropriate bikes along. 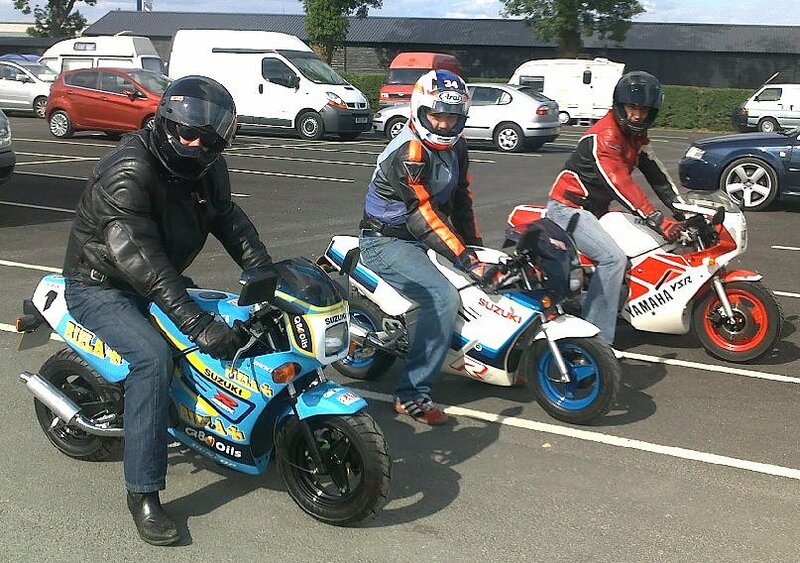 With this in mind, Darin and Tim had dragged their RB50's there and show-regular Rob E was there too with his YSR80. Customary dysfunctionality meant that by the time the three of them arrived at the meeting point, the Fizzies had gone. Darin suggested riding to Rob B's instead, which was apparently "just down the road". 33kms later, with hands, feet and bums numb from the vibration, they arrived to be met by a laughing Rob. Following a restorative cup of tea, they set off back, slightly more confident now that the bikes could handle mile after mile of throttle-on-the-stop thrashing. The YSR80 had the performance edge over the 4-strokes (this is Diff'rent Strokers after all) and Tim's big-bore RB was slightly faster than Darin's tuned one, reaching the dizzy heights of an indicated 65mph on one downhill section. Or maybe he just has less mechanical sympathy. The Gag Bike ride was hilarious, even if it did result in headaches and cramp later on. Meeting up after with the girls who were well into a bottle of plonk at Frankie and Benny's, a nice quiet meal turned into a riot of screaming toddlers, hen night parties and birthday celebrations. Next time we'll stick to the pub. When we arrived 8:15 Sunday morning, Steve was already there and had unloaded the Bimota, following a very late night working and then travelling over. Everyone stopped to admire the bike and take in the details. We pushed it onto the stand where it completed our line-up perfectly. The weather remained sunny and dry and we were a bit busier than the day before, even though some other event was happening nearby. 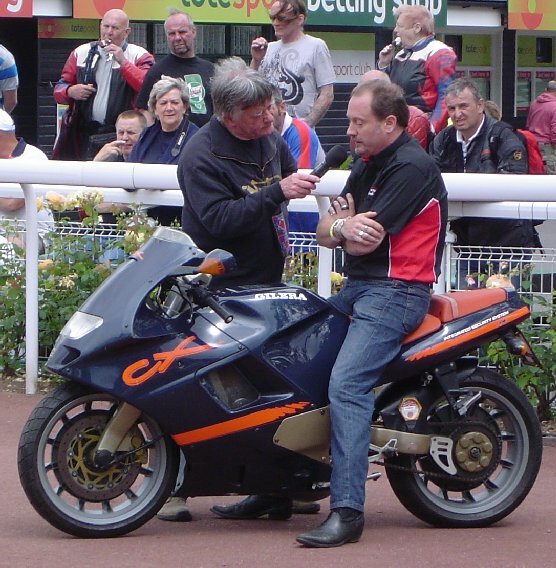 As usual, we were asked for volunteers for the 'sound-off' feature, so Darin bravely stepped up and was interviewed at length about Gilera's long and complicated racing history, before firing up the CX (electric start on a 125 !) and riding it round the parade ring - see the video. So, a quiet show and some reasons to be disappointed, but - as ever - a great chance to spend time with old and new friends. We also made a couple of useful contacts with a view to future show plans. Many thanks to Steve, Doug and Mike for trusting us with their bikes and the usual suspects for helping everything go smoothly. What theme shall we go for next year ?